Just as E3 remains ever the premiere convention for showing off the latest and most innovative video games the world will eagerly await, it is also the prime location for the titans of hardware to step up and prove to the gaming community why we should sink our heard earned dollars into their platform. This year, Sony took the stage and practically dared anyone to challenge them. Sony's conference at E3 2016 was a well paced and console/exclusive-heavy showing. Starting the show off with a full orchestral overture lead by Bear McCready, they lead right into the first demo which surprised us with an older, bearded and much less screamy Kratos teaching his son to hunt and de-horn the occasional flaming rock carrying creature that crosses their path. 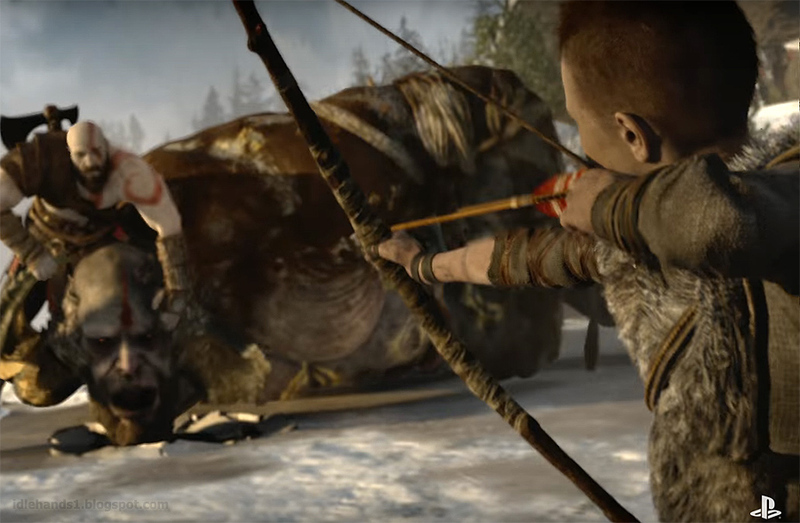 This new installment of the God of War series will take on the original PS2 game's name, simply being called God of War, but appears to offer an open world setting that flows more fluidly then its predecessors and will allow the player to explore and discover different regions of the map as you progress. A release is set for December of 2017. Sony showed the "Sony Bend" project next, formerly referred to as Dead Don't Ride and now given its formal name, Days Gone. The trailer alludes to an environment with a feel not unlike The Last of Us. A live demo of the game revealed it to be very much like the Naughty Dog hit with the addition of zombie hordes with movements straight out of of World War Z. Our protagonist runs from lurching undead pouring out of train cars, piling up and over walls and toppling across rooftops. It's going to be a long wait for December of 2017! "Days Gone is an open-world action-adventure game set in a harsh wilderness two years after a devastating global pandemic. Play as Deacon St. John, a Drifter and bounty hunter who rides the broken road, fighting to survive while searching for a reason to live." The Last Guardian made its annual appearance with an actual release date of October 25th of this year. Whether or not Sony and genDESIGN can bring us the game that has been nearly ten years in development on that date or if it will be pushed back to 2017 remains to be seen, but we were given another look at Trico, a giant eagle/dog/goat-like creature and the boy he protects. Horizon Zero Dawn made a return trip, following its premiere at last years event. Guerilla Games brought another decent demo, showing off combat dynamics in the post/prehistoric robot dinosaur stunner as well as showcasing RPG elements via dialogue choices, crafting and weapon selection. The game will see release February of 2017. The final Playstation exclusive shown off at E3 was Quantic Dream's Detroit: Become Human. The trailer features Connor, an android negotiator, sent to talk a rogue android off a ledge before killing a young girl. The clip shows a choice driven story tree that could play out with multiple endings like one of Quantic's earlier games, Heavy Rain. One can assume Connor will be joined in the game by Kara (voiced and mo-capped by Valorie Curry) who was shown first at Sony's E3 presentation back in 2012 and appears in the announcement trailer for Detroit that premiered earlier this year. The trailer is promising and will hopefully be out soon, but is marked as still under development. Sony featured a handful of VR titles, featuring the headset version of Resident Evil: Biohazard as well as VR experiences for Star Wars Battlefront, the Batman Arkham series, Final Fantasy XV and new title Farpoint, which appears to be a fairly fleshed out proper game for the Playstation VR. The headset was formally announced to be arriving October 13th of this year with a price of $399. In between trailers for Call of Duty Infinity War and Lego Star Wars Force Awakens, Crash Bandicoot was announced to be added to the latest Skylanders title, Skylanders Imaginators. Along side this reveal was a remaster announcement of Crash's first three games from the original Playstation console for the PS4. Sony's last reveal was Insomniac's take on Spiderman. The action looks intense and much is left to ponder from the few short moments the trailer provides, but we do know Marvel is involved and in the process of bringing Spiderman into the Marvel Cinematic Universe hot off of Peter Parker's appearance in Captain America: Civil War, so this could be a well developed story worthy of being seen as a slice of the MCU, or a movie tie-in flop, as per usual in the video game world. We will have to wait to see. SO..that's the lot! Critics and fans alike agree that Sony dominated the news cycles pouring from E3 this year, so they've got a lot to live up to. What titles are you most excited about? Jump into the comments below and let us know and we'll be sure to bring you updates when they drop.